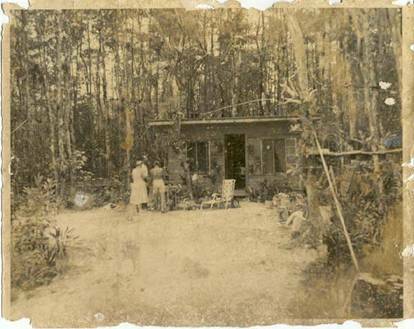 Leon Whilden lived alone in a one room shack in the Everglades. I met him while hunting snakes. He just seemed to need help, another pair of hands to help cut down trees and move logs. Leon would go crazy for no apparent reason and could remain anti-social for days. This is how I learned to survive in the swamp. He’d go nuts and I would walk into the swamp and spend one or more days before coming out to check his mental state. Back in the swamp was a large hollow cypress stump. I’ve spent many nights curled up in that stump. There was a deer stand on the edge of the swamp. Some nights I’d sleep up there. I can say that walking into the Everglades on a pitch-black night with no flashlight is real scary. The ankle deep water was okay. Knee deep was worrisome but waist deep was bad. At night with no light you move slowly. Any fast motion in the water is instantly sensed by the alligators. A gator could rip a leg off in the blink of an eye. It was a bad feeling walking in the water alone but it was far better than staying near Leon when he was in a bad mood. The best times were scaring tourists and fisherman. We would cut down Cypress tress for wood Leon needed. 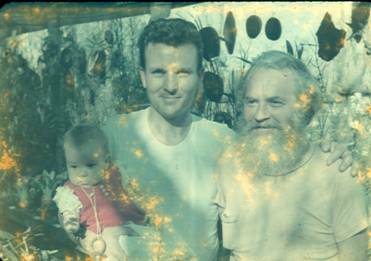 He raised orchids and the logs we cut were cut lengthwise to be turned into planters. Spacers between the halves were added as well as a screen bottom. Then a bedding material was added and small orchids were planted. 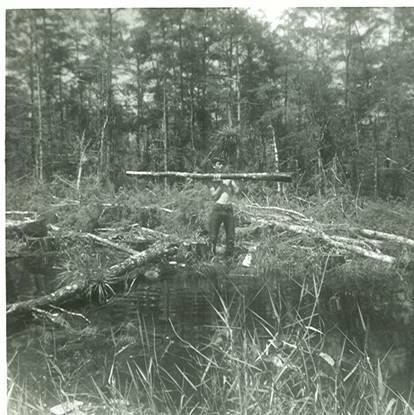 The log planters were then placed in the swamp. When the sun was really hot, sometime around 2:00, Leon and I would go under the bridge out front and wait. Below is a more recent picture of the bridge probably taken in 1996. My son Patrick is trying to get a gator to bite his bait while his sister Elizabeth looks on. There wasn’t a lot of clearance between the water and the bottom of the bridge. A perfect place to hide. The bridge circa 1996. Patrick fishing for an alligator. We’d float on our backs in the shade watching the mud daubers build their nests all the while being mindful of the large gators always watching us. Eventually a car would park on the shoulder of the road and people would walk onto the bridge to enjoy the scenery or to fish. We would be ready. Duckweed was common then and flowed with the current from the north. Duckweed is a small floating plant with a number of small green leaves and long black roots. Most plants were no larger in diameter than a dime or a nickel. Leon had poles tied to the bridge pilings. 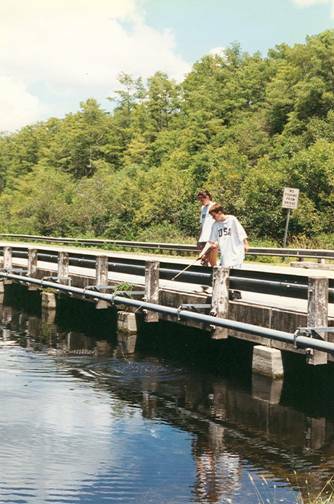 These poles floated on the surface and stopped the duckweed from filling the cove on his side of the bridge. This created clear water under the bridge and a solid surface of floating green plants on the north side. We’d take all kinds of old trash under the bridge. Shoes, beer cans, dead fish, whatever. The fisherman would drop their lines into the clear water under the bridge and let the lines drift out of sight with the current- and we’d be waiting. Leon would start making guttural animal noises to spook the folks. Then we’d carefully hook trash on the fishing lines. Using a stick we’d pull the line at the float to simulate a strike. Great sport. People excited. Cans and shoes being reeled in with great anticipation. The haunting sounds of Leon moaning under the bridge, the sounds seemingly coming from everywhere. In those days Leon had shoulder length hair and a full facial beard. A very hairy man. At what seemed like the right moment to Leon, he’d glance over at me and remove his shorts. Now totally naked he’d swim under water, under the duckweed, to a lump of white limestone rock just north of the bridge. The surface of the water would show movement, ripples. In a flash, Leon would squat on the limestone and then leap out of the water screaming at the top of his lungs, out of the water to his knees. A naked hairy man, white eyes showing, mouth open. Black duckweed roots all over his body, looked like a very hairy man. Hell, even I was scared and I knew the deal. The folks on the bridge were always freaked out. Screaming, they would leave everything and run for their lives to their car. Tires spewing gravel, then tires screaming on asphalt and the spoils were Leon’s. Every few months he’d sell all the fishing rods and tackle at a pawn shop in Naples. Those were the best times.